Introduction: Weight gain after bypass can occur in up to 10% of patients 5 years following and in about 20% of patients 10 years following surgery. This phenomenon has been studied extensively, but there is often no one reason this occurs. Once psychological and dietary reasons have been investigated, revisional surgery may be the only alternative for treatment. 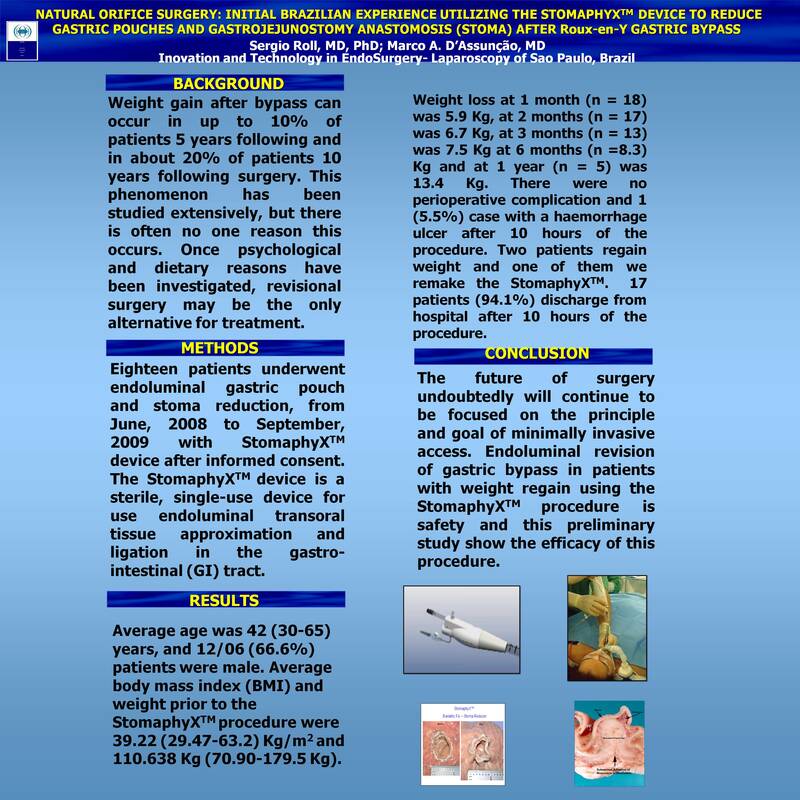 Patients and methods: Eighteen patients underwent endoluminal gastric pouch and stoma reduction, from June, 2008 to September, 2009 with StomaphyXTM device after informed consent. The StomaphyXTM device is a sterile, single-use device for use endoluminal transoral tissue approximation and ligation in the gastro-intestinal (GI) tract. Results: Average age was 42 (30-65) years, and 12/06 (66.6%) patients were male. Average body mass index (BMI) and weight prior to the StomaphyXTM procedure were 39.22 (29.47-63.2) Kg/m2 and 110.638 Kg (70.90-179.5 Kg). Weight loss at 1 month (n = 18) was 5.9 Kg, at 2 months (n = 17) was 6.7 Kg, at 3 months (n = 13) was 7.5 Kg at 6 months (n =8.3) Kg and at 1 year (n = 5) was 13.4 Kg. There were no perioperative complication and 1 (5.5%) case with a haemorrhage ulcer after 10 hours of the procedure. Two patients regain weight and one of them we remake the StomaphyXTM. 17 patients (94.1%) discharge from hospital after 10 hours of the procedure. Conclusions: The future of surgery undoubtedly will continue to be focused on the principle and goal of minimally invasive access. Endoluminal revision of gastric bypass in patients with weight regain using the StomaphyXTM procedure is safety and this preliminary study show the efficacy of this procedure.